De Forest was born in Seymour, Connecticut, (then called Humphreysville), the son of a prosperous cotton manufacturer. He did not attend college, but instead pursued independent studies, mainly abroad, where he was a student in Latin, and became a fluent speaker of French, Italian, and Spanish. While yet a youth, he spent four years traveling in Europe, and two years in the Levant, residing chiefly in Syria. In 1850, he again visited Europe, making extensive tours through Great Britain, France, Italy, Germany, Greece, and Asia Minor. From that time, he wrote short stories for periodicals, having already become an author of several books. The honorary degree of A. M. was conferred upon him by Amherst College in 1859. With the advent of the American Civil War, De Forest returned to the United States. As a captain in the Union Army, he organized a company|company from New Haven, the 12th Connecticut Volunteers. He served constantly in the field until January 1865, taking an active part under Maj. Gen. Godfrey Weitzel's command in the southwestern states, and under Philip Sheridan in the Shenandoah Valley. Graphic descriptions of battle scenes in Louisiana, and of Sheridan's battles in the valley of the Shenandoah, were published in Harper's Monthly during the war by Major De Forest, who was present on all the occasions thus mentioned, and though experiencing forty-six days under fire, received but one trifling wound. He was one of only two or three American literary men that laid down the pen for the sword. De Forest mustered out from the volunteer army in 1865 with the brevet rank of major. From 1865 until 1868, he remained in the Regular Army as adjutant general of the Veteran Reserve Corps, and after the war was placed in charge of the Reconstruction of Greenville, South Carolina. His letters of this time were published posthumously as A Volunteer's Adventures (1946) and A Union Officer in the Reconstruction (1948). In 1867, De Forest published his most significant novel, Miss Ravenel's Conversion from Secession to Loyalty. In contrast to much of the Civil War fiction that had gone before it, Miss Ravenel's Conversion portrayed war with a bloody reality, rather than idealism. 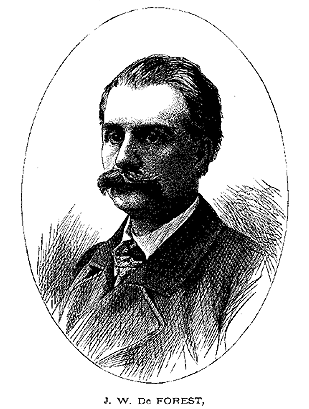 Though William Dean Howells praised him as a "realist before realism was named," most critics have argued that the Romantic elements of De Forest's plot mix poorly with the admirable realism of the battle scenes. Writing for The Nation two years later, De Forest called for a more general movement in American literature toward realism; the essay's title, "The Great American Novel," is generally credited as being the first known use of the term. He died in New Haven, Connecticut. De Forest wrote essays, a few poems, and about fifty short stories, numerous military sketches, and book reviews, most of which were anonymous. In 1873, he contributed to The Atlantic Monthly a short serial story entitled "The Lauson Tragedy." This article incorporates text from the public domain Appleton's Cyclopedia of American Biography.